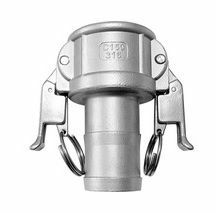 Fuel Transfer Self-Locking Coupler Type C, is a Female Coupler x Hose Shank that includes Self-Locking handles that are also in Stainless Steel. The couplers are provided with standard Buna-N gaskets and offer the same standard working pressure as non self locking couplers but allow a sure way to lock the handles for safety purposes. The self-locking system that these couplers provide insure a safe and ease of use for all industries.